I am looking for a cross bike to train. I really liked the Lemond Poprad but they discontiuned the canti version and I feel that Discs are OVERKILL. I have considered a Trek XO 1 but I would prefer a steal bike, steal is real. I have been looking at the On-one Il pomino and the Surly Cross check. I would run single and geared most likely. Any suggestions or other posibilities? Does anyone here oftern ride a road SS in groups (is it difficult to keep up due to gearing changes)? According to my LBS Lemond is going to produce more with canti's as the disc are not selling and racing regulations forbidding disc. Also check out the Bianchi San Jose as its a steel bike set up as a SS and can take cross size tires and the like. Test rode one last week and liked it for the most part. You are going to have trouble staying with the group on B+ rides with the gearing even if you are in great condition. 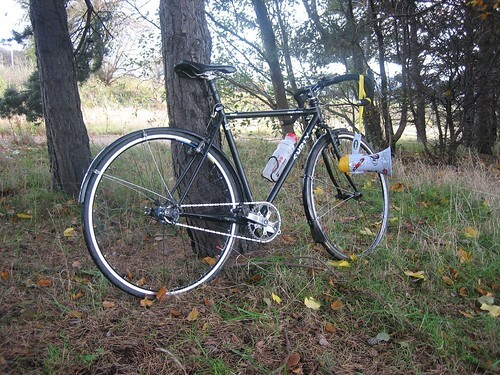 I wanted an inexpensive steel cross bike and picked up a new Bianchi Volpe for ~$750. Not as much soul as a Kelly or Gunnar, but at least I can get in some saddle time now on the road while all this snow melts. For SS, you'd need to run a tensioner, since it has neither an EBB or slotted dropouts. the surly is pretty solid. i'm rocking a specialized tricross comp with the carbon stays and i love it. also running 10 speed 105 with a triple, but i might need all those gears on trans iowa. might break your bank at $1800 or so. on the keeping up thing, there's a guy who rides a single speed steel cross bike (i forget the make) with our road riding group and he keeps up okay. sometimes he's churning out a 130+ cadence but he makes it. huge fan of my cross-check. run it as a ss cx bike during the season and a fixed for winter commuting. Hopefully not OT but why is fixed preferred for winter riding? What kinds of conditions warrant that? And is the bullhorn part of your 'winterazation'??? Winters here in Scotland tend to be cool and wet, so prefer to keep my geared bike away from the grotty, gritty and salty roads. When I ran gears on my commuter it seemed like a constant battle to keep the cables and mechs moving. A decent, very versatile frame for the price. I built up one (my first cx) a month ago. It's a SS and I'm running it with Nokian studded tires for ice and packed snow riding. The frame is heavier than I'd like but again, for the cost it's nice. The "semi-horizontal" track mounts with the little screw adjusters (you'll see what I mean if you get the frame) are great for SS applications. One thing I'd likely do different though. Going from a mtb to drop bars has been tough for me. They are low even with a riser stem and a bunch of spacers. I find riding in the "hoods" pretty uncomfortable. 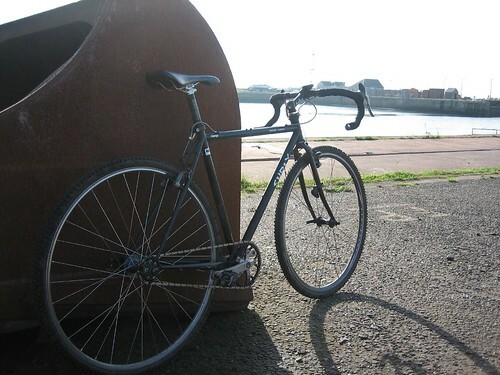 What I'd do if I had the chance again would have been to use my spare flat bars, bar ends, and v brakes and not spend the cash on drop bars and canti brakes and new levers. YMMV. Still I'm quite happy with it. One thing I don't like is the little cable stop Surly has you mount to the rear seatpost clamp. It forces you to run a nasty little angle on your cable housing to the rear brake. I spoke with Surly and they claim they are redesigning it. **grabs bullhorn** "GET OUT OF MY WAY YOU HALF-DEAF HIKERS"
Miker J - what lever are you using? I swiched to a pair of Cane Creek SCR-5s and they're nice and wide and comfy - compared to the Shimano aero things they replaced. Last edited by naegears; 03-02-2007 at 02:55 AM. Miker J - what lever are you using? I swiched to a pair of Cane Creek SCR-5s and their nice and wide and comfy, - compared to the Shimano aero things they replaced. They are nice. I suppose I'm just not use to feel of drop bars yet. ok here's a dumb question.. I just picked up an '07 poprad tonight. how do you downshift this beast?